The two-time Stanley Cup champions have an aging core, but will they have a prospect or two coming through? Gabriel Vilardi, the Los Angeles Kings' first-round pick in the 2017 Draft, has been flirting with breaking into the lineup. The 19-year-old center is a physical presence on the ice with his large frame and is a very good two-way player, ideal to anchor the third line. He was highly-tipped to start the season with the Kings, but after suffering a back injury that ruled him out of rookie camp, Vilardi will be probably back in the OHL for opening night. He is still definitely expected to step up to the NHL at some point during the season, and maybe even at the beginning of the season, as there is still a lot of time for the GM Rob Blake to make up his mind. Vilardi was drafted at No. 11 in the 2017 draft, a "no-nonsense" pick by the Kings as he was the highest-rated prospect available at that point. 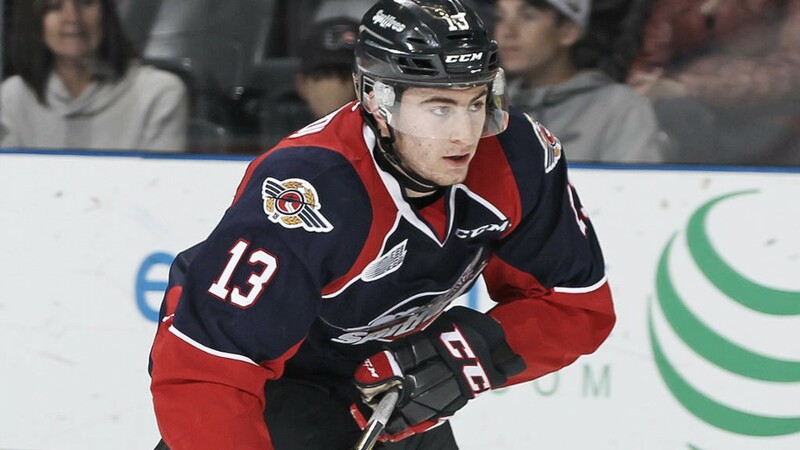 Vilardi was dominant in the OHL last season, picking up 58 points in 32 games with the Kingston Frontenacs, the fourth-highest scorer on his team despite playing less than half the games. The center is 6'3", 201lbs, and a very strong player for his age, and will only get stronger with age. "A dangerous two-way center who stays poised, calm, and composed in all situations. Individual puck skills are at an elite level and he is able to play a finesse role. Makes excellent decisions with the puck and showcases a well-rounded understanding of both the offensive and defensive game. Uses his size to his advantage and keeps the opposition guessing because he is able to do so many different things"
How can Vilardi make the Kings better? The Kings' third line is likely to be Alex Iaffalo, Adrian Kempe, and Trevor Lewis. Both Iaffalo and Kempe can play center, but Vilardi would add physicality to the Kings' third line, as well as providing some defensive cover. Vilardi was expected to be on the roster opening night in July, but after his back issues ruled him out of camp, we probably won't see the 19-year-old on the main stage until later in the season, unless another injury comes up. Kings have two very strong goaltending prospects. Cal Petersen had a solid season last year with the Ontario Reign and is expected to be the starter. Matthew Villalta is four years younger than Petersen and will continue to develop in the OHL after being drafted by the Kings in the third round of the 2017 draft. This year's Kings' first-round pick Rasmus Kupari is staying in the Finnish Liiga to develop, and is reportedly a season or two away from being ready to make an impact at NHL level if all goes to plan. 23-year-old defenseman Daniel Brickley is set to make 2018/19 his rookie season after three years at the University of Minnesota, likely playing on the third defensive pairing with Derek Forbort. Gabe Vilardi is a good addition to the Kings, but will probably not start the season with them. The 19-year-old probably won't be in the conversation for the Calder Trophy, but he will add strength to the third line and will lock down a roster spot. What are your thoughts on the fate of Gabe Vilardi or the other prospects in the Kings' system ? Will he jump to the NHL and stay? Let us know in the comment section below, and make sure to give us a follow on Twitter (@VAVELNHL_ENG) for more updates!